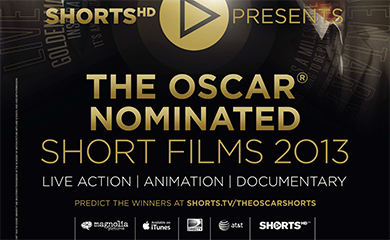 Once again this year's Oscar Nominated Animated Shorts program drives home the death of quality material there must be to choose from. Just as TV has supplanted the cinemas as the place to find smart, well written dramas from grown-ups, so too does it seem to be the home for quality animation. It's the home for a lot of crap, too, but there are enough creative shows on outlets like Comedy Central's Adult Swim and the Cartoon Network that most aspiring animators with talent and a good idea are going to try that route before they put too much time and hard work into a theatrical short that few are likely to see (the exception being Disney/Pixar, who generally do a couple shorts a year to precede their features and who not surprisingly made the list of nominees this year). Anyway, here's a rundown of what you can expect in this year's program. A Single Life – A really short (2 minutes) and kind of gimmicky CGI admontion not to live life too fast. A woman is sent a mysterious 45 record. The faster it plays, the faster she ages, although she can turn back time by moving the needle back. Clearly she shouldn't mess around with this, but she can't help herself from wanting to see what life has in store. What could go wrong? Feast – This one played before Disney's BIG HERO 6, and it's a real crowd pleaser. A love story as seen through the eyes of a puppy, the quality of whose mealtimes rise and fall with the romance. Pretty much the only example of a classic Hollywood style cartoon in this year's program, and my pick for the win. Me and my Moulton – A middle sister looks back to when she was 7 and all she and her sisters wanted was a bike. Their mom and dad are moderninst art critics that the other kids think are a bit weird, causing the typical kid embarrassment over one's parents. Of course even the bike they ultimately get is weird, but its okay because they're family. Eh (shoulder shrug). 14 min. The Bigger Picture – A stop motion short that uses paper cutouts and various objects to tell the story of two brothers dealing with an aging mother and the problems that arise therefrom. Not an especially insightful look at the subject, but the animation is good. 7 min. The Dam Keeper – This one is a fantasy about a pig child who lives in a windmill on top of a dam and “keeps the dark away”. Despite providing this valuable service, the other kids are cruel to him. At least until a new kid, a fox with artistic tendencies, joins the class and the two bond over art. Nice anti bullying theme, but just never came to life for me. 18 min. Duet – A symphony of light and movement that follows a boy and girl from babyhood to young romance. Not a lot of substance, but it's a symphony of light and movement that does a good job showing what the animation artform is capable of. Probably more deserving of nomination than a couple of the actual nominees, in my opinion. 3 min. Bus Story – Like “Me and My Moulton” this one is a reminiscence, in this case about a woman's first year driving a school bus in a small town. Her boss is a grump, and the kids a bit surly, but over time it gets better. Nothing mindblowing, but it's good natured and funny. Footprints – Typically oddball Bill Plympton short in which a man investigates a broken window by following the tracks of the assailant. Has a delightfully nightmarish feel, but probably a bit too typically Plympton to warrant a nomination. Sweet Cocoon – A fat caterpillar tries to fit into its cocoon. Eventually it makes it with a little help, but it doesn't end well. Kind of reminded me of this weird South Korean show my son has discovered on Netflix called Larva, which is frankly more twisted and funny, although the animation on the show isn't as good as what's here.